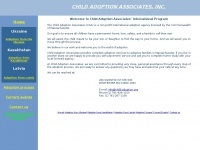 Child Adoption Associates. The Child Adoption Associates (CAA) is a non-profit international adoption agency licensed by the Commonwealth of Massachusetts. The web server used by Child-adoption.org is located in Burlington, USA and is run by The Endurance International Group. There are many websites run by this web server. The operator uses this server for many hosting clients. In total there are at least 3,932 websites on this server. The language of these websites is mostly english. A Apache server hosts the websites of Child-adoption.org. HTML 4.0 Transitional is used as markup language on the webpages. Due to the use of frames and framesets the visibility in search engine results may be affected negatively. The website does not specify details about the inclusion of its content in search engines. For this reason the content will be included by search engines.